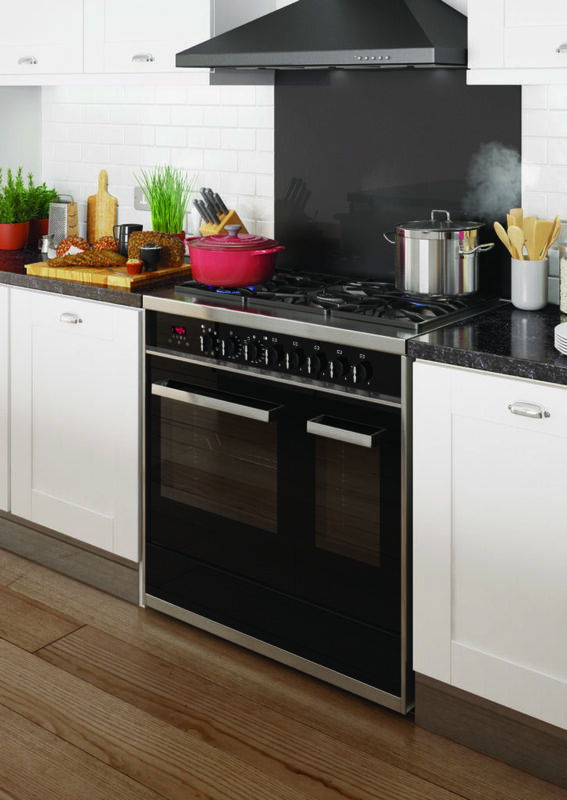 If you are a fan of the most traditional style of oven cooking then a gas range cooker could be perfect for you. There is something primal about the oven burners firing up and the cavities being filled with heat, creating a range of different temperatures inside the oven like a spit at different heights over a fire. Our all-gas range cooker is professional in style and performance. The stainless steel exterior would not look out of place in a restaurant kitchen, and it has cooking capabilities to match. It features 6 burners that provide ample hob cooking space as well as two gas ovens for preparing food efficiently and multiple courses simultaneously. Many people enjoy being able to adjust the cooking time and style by simply moving the food up or down a shelf in the oven. The hottest temperatures are at the top of the oven, while it remains slightly cooler at the bottom. Now with a handy minute minder you can time meals to perfection and control the oven temperature without too much touch control technology. Extra details like the minute minder and storage drawer provide the home comforts that you would not get in a professional kitchen, makes the RC9322 perfect for any family home. Many restaurant kitchens use this style of oven as it is a reliable style of cooking and preheating is quick. The steel is easy to wipe clean and looks practical and hygienic. It will withstand heavy use with solid handles, double glazed doors, steel exterior and robust cast iron pan supports. This model is built for a tough life. If you make enormous curries, stews and roast dinners or use heavy cast iron cookware, this is ideal for you. There are some surprising extra features on our gas range cooker. As well as a double cavity cooking space and 6 gas burners, this model also has a wok burner that fits on top of the hob to support curved bottom cookware. This allows you to get adventurous with Asian cookery or simply be safe in the knowledge that you are far less likely to spill hot fat. There is also automatic ignition that simply clicks each flame into life and a rear back guard to the hob that stops fat and grease splattering up the wall. The most exciting feature is a built-in rotisserie, inside the oven cavity. This works to automatically turn meats over the burner, just like a traditional spit roast. You can now achieve authentic rotisserie chicken or shish kebabs at home, in your oven! 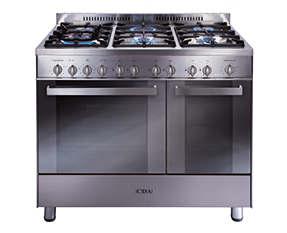 Bring out your inner professional chef and find the primal caveman or woman inside of you with a solid steel, gas range cooker but retain your modern convenience with its handy timer and storage drawer for pots and pans; as well as built-in safety features like our flame failure device that is fitted as standard.